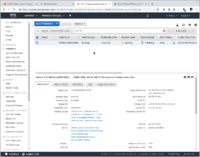 This page documents how to launch a Funtoo Linux Amazon EC2 instance. 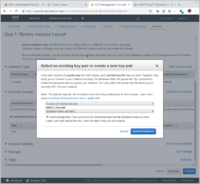 The first thing you'll need to do, if you haven't already, is to head over to https://aws.amazon.com and create an account so that you can log in to the AWS Console. If you create a new account, you'll be using your "root credentials" to log in. Eventually, you should create an IAM User account to log in, instead of using your root credentials to log in, as this is a good security practice. 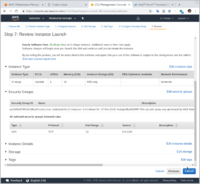 While the steps to do this will not be covered in this document, you can read more in the official AWS documentation on how to do this. OK, now you are logged in to the AWS Console. The first thing you'll want to do is to choose a region in which you'd like to deploy your Funtoo Linux image. This is done by selecting your preferred region in the upper right-hand corner. Once you are in the correct region, it's now time to launch an image. First things first -- select your region! To launch a Funtoo Linux image, we'll go through a "UI wizard" process that initiates by clicking the blue Launch button at the top of the screen. Once clicking this button, the UI wizard will start to guide you through the process of creating an image. We'll go through each screen below. Confirm that you want to 'subscribe' to Funtoo Linux. Now, click the blue Select button. 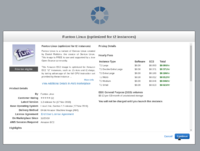 You'll now be prompted to confirm a subscription to Funtoo Linux. 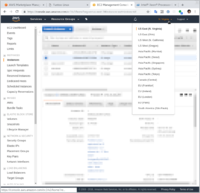 Note that this doesn't actually incur any additional charges from us, since our images are available free of charge, but Amazon still records you as having "subscribed" to Funtoo Linux anyway: You'll want to click the blue Continue button to continue. Next, you'll be prompted to configure the instance. In general, the defaults are typically fine, but make sure that Shutdown behavior is set to stop, so that when you shut down, your instance will still exist but in a dormant state. Don't click "Review and Launch" at this point! We'll want to continue to "Next: Add Storage"! Next, we'll want to continue to the next screen by selecting the non-highlighted Next: Add Storage button. Most instance details can be left at their defaults. Skipping this step will result in your AMI having only 8GiB of disk space total! This is because AMIs are created with a minimally-sized root EBS volume. You should modify the size of the root volume to suit your needs. At boot time, Funtoo Linux will resize the root volume to utilize all available space. When Funtoo Linux first starts, it will automatically resize its root partition and filesystem to take advantage of all available space, so that your additional storage space will be available by the time you log in. Expanding the size of the root volume is important! The next step, Adding Tags, can be safely skipped. Proceed to the next part of the wizard: Configure Security Group. 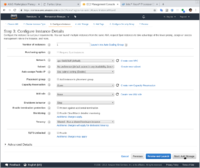 This next section allows you to configure a security group for your new instance. This security group is what defines what kinds of connections are allowed to be made to your new instance. By default, we ship with an auto-generated security group that allows SSH access (via TCP port 22) from anywhere on the Internet. You should select this security group, or alternatively can select another security group that allows appropriate access. 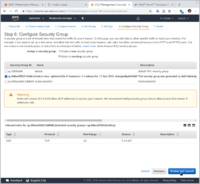 Our default security group is ideal for initial login, but as you gain familiarity with AWS, you should consider restricting access to the IP(s) you use to access your Funtoo Linux virtual machines. Doing so is beyond the scope of this simple introduction but we welcome contributed documentation on how to perform these steps. To be able to log in from any IP, you will want to make sure that your security group contains a rule that matches the one shown below. Be sure to choose a security group that allows you to SSH in! Time to launch -- for real! For security reasons your downloaded private key must be chmod'ed 400 or it *will* fail and ask for a non-existant password. Time to choose a key pair, or create a new one. The authenticity of host '54.152.74.161 (54.152.74.161)' can't be established. ECDSA key fingerprint is SHA256:06VxabD5Gom5FRzpg7jZrBWro+TJkZBFa2+29WTSII4. Warning: Permanently added '54.152.74.161' (ECDSA) to the list of known hosts. // instruction sets offered by Amazon Web Services. 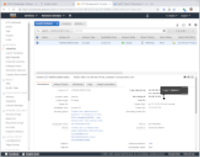 This page was last edited on March 13, 2019, at 04:41.